The Met Office issued 59 flood warnings and told residents to take “immediate action” yesterday across much of England and Wales. The Environment Agency still has 31 flood warnings and 46 flood alerts in place while a further 78 locations are said to be at risk over the last 24 hours. 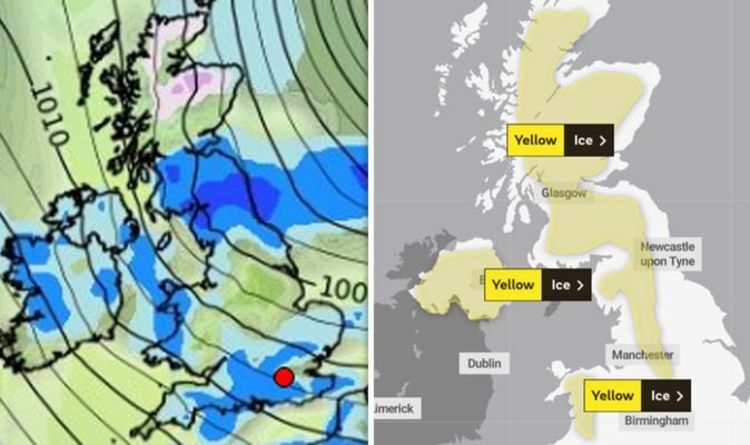 The Met Office has yellow weather warnings for ice across north Wales, northern England, Scotland and Northern Ireland as Britain continues to suffer a return to wintery conditions. A spokesman for the Environment Agency said: ”Persistent heavy rain this weekend means that river levels are high and flooding is expected in some areas. “Our teams are out on the ground operating flood defences and installing temporary flood barriers to keep communities safe." Much of northern England was blanketed in snow yesterday and drivers faced hazardous conditions on the A1 through Northumberland. Confused daffodils at picturesque Alnwick Castle saw spring revert to winter. Severe flooding caused chaos in north Wales, where the River Conwy burst its banks, the Yorkshire Dales, north Yorkshire, Lancashire, Newcastle, the Midlands and Devon. York was particularly badly hit as the water line rose as high as car windows and ducks swam in the street. Heavy downpours also closed the M66 motorway in both directions near junction 1 in Greater Manchester. Hundreds of gritters in England and Scotland were on standby to protect road surfaces overnight and Police Scotland issued a warning to motorists for icy conditions throughout Sunday. Former BBC and Met office weather forecaster John Hammond put the stormy weather down to a strong polar vortex. Mr Hammond said: “The polar vortex is strong so the jet stream is in rude health. As for Sunday, the Met Office has yellow warnings for ice, meaning there is an increased likelihood of accidents or injuries, across northern England, north Wales and all of Scotland and Northern Ireland. The Met Office’s Marco Petagna warned of wind and rain in north western parts of the UK. In his latest forecast, the meteorologist said: “We’ve got some icy conditions this morning towards the north and north-west of the UK with wintry showers too. “Into England and Wales there’s the odd icy patch out towards the west and quite a few showers here too. “Further showers will push in to the north and west, some of them quite heavy and we could see some hail and thunder in places. “Still some wintriness across the hilltops. The Met Office also warns of a cold night “with a widespread frost” and “isolated fog patches” developing.